In this “deep” Hubble Space Telescope image taken in the northern sky, nearly every object is a galaxy. 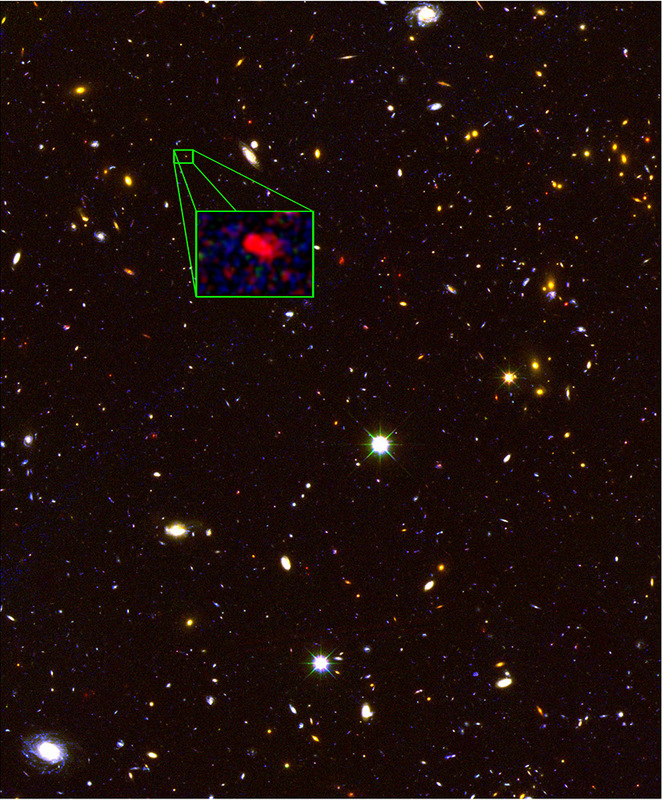 The zoom highlights galaxy z8_GND_5296, now honored as the most distant galaxy known. The photons that made this pic were created 13.1 billion years ago, just 700 million years after the Big Bang. A survey of ultra-distant galaxies has zeroed in on one, poetically named z8_GND_5296, that is the oldest galaxy ever seen. Astronomers measure distance by the strength of the red shift, caused by the same Doppler effect that alters the horn sound from a passing train, and “z8” came in at an unprecedented red shift of 7.5. That means the galaxy is being seen as it was 13.1 billion years ago, just 700 million years after the Big Bang, says study first author Steven Finkelstein, an associate professor of astronomy at the University of Texas at Austin. That’s the second-oldest astronomical object ever observed: One star explosion, from an unknown galaxy, occurred 70 million years before z8. The discovery came during a study of 43 elderly galaxies identified by the Hubble Space Telescope. Using a spectroscope attached to the giant Keck 1 telescope in Hawaii, Finkelstein and his colleagues sought a distinctive breed of electromagnetic radiation called Lyman alpha. 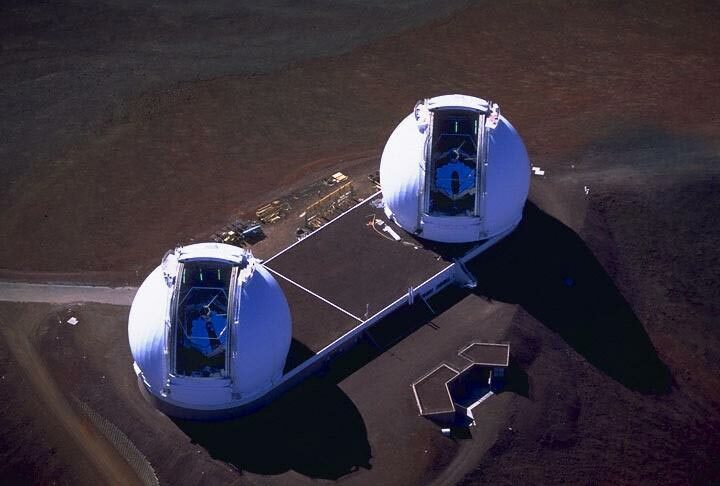 To see the oldest galaxy, one of the 10-meter Keck telescopes on Mauna Kea in Hawaii was used to grab data on the spectrum of light that has been traveling for most of the history of the universe. Lyman alpha radiation is released when hydrogen’s sole electron relaxes into its lowest orbit. Hydrogen is the most abundant element in the universe, and Lyman alpha’s wavelength is relatively easy to measure with a spectroscope, even after a severe red-shifting due to the expansion of the universe. So why was Lyman alpha only visible from one of the 43 geezerly galaxies? One answer could be a fundamental change in the universe. Today, hydrogen between the galaxies is ionized into bare protons, and Lyman alpha can move freely. But early in the universe, intergalactic hydrogen was apparently made of neutral atoms, which block Lyman alpha like a political campaign drowns difficult truths. And thus finding Lyman alpha from only one the ancient galaxies may mean the change from neutral to ionized state had already begun 700 million years post-Bang. As best Finkelstein and his crew can figure it, z8 contains the mass of 1 billion suns; in round numbers, about 2 percent the mass of our Milky Way galaxy. Like many astronomic discoveries, the ancient galaxy study relied on data from the Hubble Space Telescope. 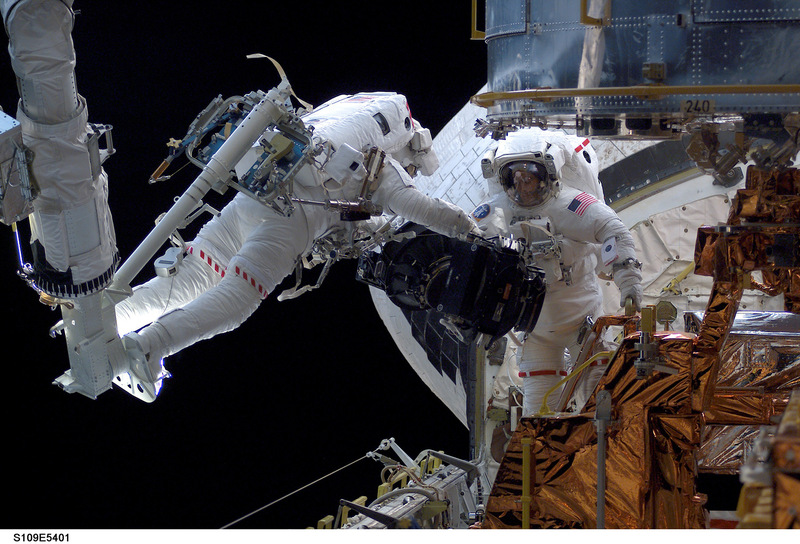 With his feet latched to the robotic arm of Space Shuttle Columbia, astronaut Michael Massimino works with James Newman to make upgrades to Hubble in 2002. But even though the Big Bang created only hydrogen and helium, the concentration of heavier atoms in Z8 reaches 20 to 40 percent of the level in the sun. Because these heavier atoms are made only in star explosions, plenty of supernovas must already have occurred by 700 million year after the Bang. The most surprising finding about z8, however, concerned the quick congealing of hydrogen and helium into stars. “Before, we thought a decent guess for a typical rate of star formation at this time was 10 solar masses per year per galaxy, and this is 30 times higher,” says Finkelstein.